The ITIL (Information Technology Infrastructure Library) exam is the ultimate certification for IT service management. 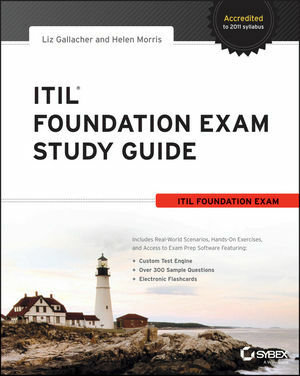 This essential resource is a complete guide to preparing for the ITIL Foundation exam and includes everything you need for success. Organized around the ITIL Foundation (2011) syllabus, the study guide addresses the ITIL Service Lifecycles, the ITIL processes, roles, and functions, and also thoroughly explains how the Service Lifecycle provides effective and efficient IT services. Download valuable study tools including practice exams, flashcards, a glossary of key terms and more. If you prefer self-study over the more expensive training course, but you don't want to skimp on information or preparation, then this study guide is for you. Liz Gallacher has implemented improvement programs based on the ITIL framework for many different organizations. Liz holds the ITIL Manager and ITIL Expert certifications and was a member of the ISEB Managers Certificate Examiners panel. Helen Morris has implemented improvement programs for a wide variety of organizations, based on IT Service Management best practice. Helen holds the ITIL Manager and ITIL Expert certifications. She also holds the ISEB Consultancy certificate, and specializes in service management consultancy. Both Liz and Helen are fully accredited ITIL trainers. Thank you for your interest in this Sybex product. This downloadable product includes the practice exams, flashcards and glossary of terms. To access the free downloadable files, please login or register by clicking the following URL. You'll proceed to the login/registration screen. Unzip the downloaded file on your Windows computer. ** Note that the interface will not function properly unless you first unzip the file. Click on start.exe to open the interface. Read through the license agreement, and then click the Accept button to browse the contents. If you experience trouble with the start.exe file or interface, please refer to the product ReadMe.txt file. 4. Which of the following is a type of service provider? 4. Which of the following is not a recognized type of service provider? 6. Event management can be used to monitor which of the following?